I'm happy to announce the Discussion, Writing, Activity and Service Guide for my YA verse novel The Language Inside (Delacorte/Random House 2013). You can download this extensive Guide HERE. Created for classrooms, book groups, readers and writers, included in the guide are discussion questions, essay topics, poetry prompts, extension activities and service project ideas. Here is my blog announcement about the guide, and here is The Language Inside page of my website. Here is a post about Lowell, Monkey Dance and the Southeast Asian Water Festival, here is a post about Julia Tavalaro and Inspiration for The Language Inside, and here is a recent PoetryFriday interview of me about The Language Inside. I hope you enjoy The Language Inside and this new Guide. As always, I am available for school visits. The Red Dot longlist spreadsheet was made public on Sep. 2 (see previous blog post) and several of us have added our comments. I had hoped to close the document last Monday, but (of course) got waylaid by school things and didn't get this blog post written. So let's go for this Monday as the deadline. Those people who enter comments on books by end of day Monday, September 16, will get a Doodle invite to set a date to get together in person - as many of us as possible - to determine the shortlists, which should be announced by Sep 30th. So see which ones you've read and want to argue for. Instructions re how to enter comments are on the first tab of the spreadsheet. I don't know how many of you are going to the Google Apps conference this weekend at SAS (I think there's still space, if you're interested). 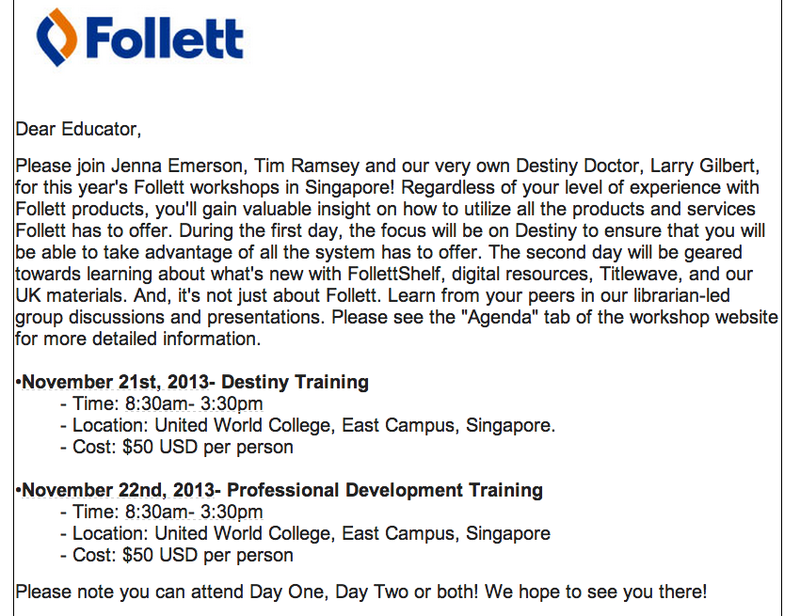 I went last year and found it useful, e.g., on how to use scripts to do mass emails using Google Spreadsheets. It's also good to be reminded of the deeper features of Google Search. Many of the presenters are Google employees flown in for the event, while other workshops are offered by local people like us. I'll be doing a session on Sunday morning called "Geeking out with GoodReads" together with a middle school English teacher from Dover -- Angie Erickson. 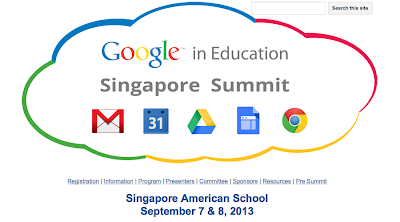 We'll be publishing a Google Site of our presentation -- bit.ly/goodreadsgeeks -- so you can see what we covered. It's not public yet (as it's not finished - haha) -- but, after Sunday, have a look. 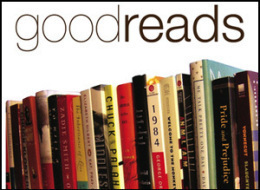 See our library network's GoodReads profile here. Jenna Emerson, Tim Ramsey, and Larry Gilbert are running a Follett Workshop in November at UWCSEA East. Click here to register or see more information. The workshop is being hosted in our school's Centre for International Education -- which offers a variety of workshops, all of which are open to anyone. Check out the list here. If you click it, you'll go to a public Google Spreadsheet which anyone can edit. Just like our Recommended Suppliers page. I'd been meaning to make a list of all the library-related journals available via the NLB (no longer freely available to us - sigh), but never got around to it. 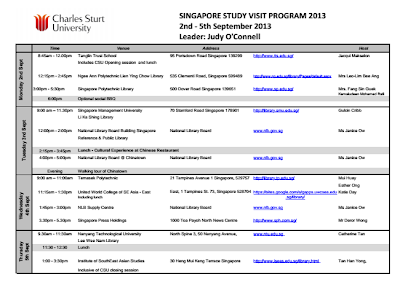 Then Anthony Tilke, the new secondary TL at the UWCSEA Dover campus, started making a list of library and book review journals and their priees/availability for our internal purposes -- and I said, oh, let me make it the start of an ISLN shared resource. So add to it -- fill out the information -- as you will. 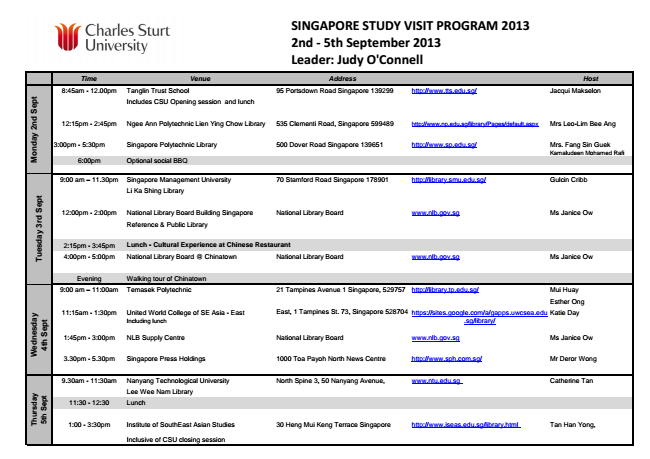 This week Judy O'Connell is in Singapore with 25 Charles Sturt University distance-learning students in librarianship for a week-long study visit. Most of them have come up from Australia, while a few are living here in Singapore (e.g., our own Suzanne Parfitt at Tanglin, and Nadine Bailey, a UWCSEA parent). We will hopefully be socializing with them on Wednesday night, after our network meeting. And click here for a list of general questions about libraries that the students will be considering as they visit each library. It's a good reminder of the things we all should be aware of.